Georgetown, MA - July 27, 2011 - The next generation of protecting single-use biopharmaceutical bags was announced today. The BioShell™ Suspension Pack, by UFP Technologies, advances bag protection with a universal storage container protecting contents within a cushion of air. The first generation of BioShell™, launched in 2009, was an innovative solution for frozen bag protection that became widely adopted across the BioPharm industry. The BioShell Suspension Pack is the next step in protection, offering versatility for both liquid and frozen bags. Biopharmaceutical bags placed inside of the BioShell Suspension Pack are enveloped tightly in a durable film that suspends products within a polycarbonate shell. The suspension film absorbs shocks during impact, preventing damage to the bag by eliminating contact with the outer shell. The design allows for use with a varying number of tubes, tube lengths, data loggers, clamps or filters without sacrificing protection. All contents are in plain sight through the UV protective shell and film. Any possible kinks and/or stress points are in view for quick correction. "The BioShell Suspension Pack offers unmatched versatility for bag protection," said Tuna Sava, Manager of BioPharm Products. "Varying sized bags - at any fill level - can be loaded into the same shell without compromising security. 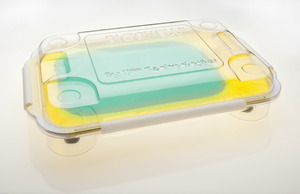 The shell can be used as a process tray for liquid bags as well as for freezing, storage and transportation," says Sava. The BioShell Suspension Pack will be on display at the ISPE Annual Meeting November 6-9 in Dallas, TX. For more information visit www.bio-shell.com or call 800-372-3172.